RGS Music are a small Argentine label known hitherto mostly as the publishers of the album Yiddish Tango. But in 2011 they struck gold with this new series - at a bargain price. These discs may be available from us priced £10 + p&p except where shown. Click on the word "tracklist" under each CD to make the tracklist appear and disappear, or use these buttons to show or hide all the tracklists (not recommended). Carlos Gardel's favourite singer, a wonderful voice I can listen to all day. A film star voice, Lamarque would not have been out of place in a Hollywood musical. Perfectly timed to take advantage of the deletion of Poema comes this new CD from RGS featuring the 1936 recordings with Roberto Maida. Apart from a cracking transfer of Poema you get a whole bunch of beautiful tracks. Their tender rendition of the Donato classic El adiós is a real surprise. If you've already got Poema you don't need this. If you are planning on a big Canaro collection, than the Canaro/Maida CDs on Reliquias are a better choice - if you're looking for a single CD, or a gift, then this is for you. The fidelity is very good throughout. This new instrumental CD of early Juan D'Arienzo (1936-1938) is a mix of classic cuts and some cracking, hard to find tracks such as El baqueano and Melodía porteña. Since El Bandoneón deleted their Donato CDs a few years ago, there has been nowhere to refer you to for lots of classic tracks from Edgardo Donato. El huracán, Chiqué, Hácete cartel, and La cumparsita were completely unavailable, whilst Santa milonguita, El día que me quieras, Ruego, were only available on an expensive mp3 collection from Argentina. I could also add El chamuyo, only recently available once more on the 10 CD box on Membrán. Now you can find all these tracks on this new CD from RGS. The CD is not entirely classic 30s Donato cuts however; there are also 7 cuts from 1950-1951. Apart from the instrumental El acomodo, you can spot these on the listing from the vocalists, Adolfo Rivas and Carlos Almada. These are mostly forgettable, although the vals is fun and it's interesting to hear both versions of Donato's signature track, Se va la vida. The fidelity is okay, but nothing outstanding, certainly no better than what we had from El Bandoneón. As so often with Argentine labels, the singer information on the back cover is incomplete. Nevertheless the album becomes essential by virtue of being the only player in a sparsely populated field. Great value at 25 tracks. Yes! A new CD of Julio De Caro's early recordings (mostly 1926-1930). Julio De Caro is the man who brought musical depth to tango in the late 1920s, the direct inspiration for the later ensembles of Osvaldo Pugliese and Pedro Laurenz (who played bandoneón for De Caro). De Caro may lack the force and strong rhythmic drive of the 1940s groupings and he retired (in disgust?) once D'Arienzo had come to the fore. However, his music has stood the test of time. It's still played regularly in milongas and is eminently danceable, as well as great to listen to. Like the other releases in this series, this is a generous album at 23 tracks. There's lots of material here that has become quite hard to get since the deletion of the RCA Victor 100 Años series and the virtual disappearance of El bandoneón. The fidelity is good and so are the selections - I shan't go through them, they are excellent; only Flores negras is missing. Wow! A new CD of the Orquesta Típica Victor at a bargain price. The disc is generous at 23 tracks and there is lots of material that isn't on EURO, including their rare version of El amanecer. Fabulous! If you like the old style music, this is for you. Note: tracks 13 and 14 are switched on the CD. Track 13 is actually Dominio, and Track 14 is Chorra. AT LAST! For several years, people have been asking me for a CD of Fresedo's early sextet. Here it is. My favourite female voice after Ada Falcón, not quite as dramatic, but rich and expressive. Her darker tones suited an orchestra better than the sopranos and she sang a couple of tracks with Adolfo Carabelli, including her signature tune, Cantando. Another of the great female voices of tango, Rosita Quiroga conveys an air of melancholy and nostalgia. Her vocal style differs from the other female singers in belonging more to the country than to the city, and has been described as descending from the payadores (troubadours). Wow! 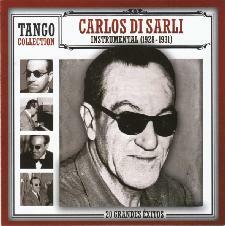 A new CD of Carlos Di Sarli's sextet at a bargain price. The quality is so high, I won't even bother naming individual tracks. These fabulous sides won't be to everyone's taste. Beats me though. I just can't get enough of this period. For the dedicated collector, there are only a couple of new tracks compared to the the EURO records CD - but this is much cheaper. Despite the title, don't forgot that there is an estribillista (refran singer) on Maldita: that fine voice is none other than Ernesto Famá. Charlo (Carlos José Pérez) was one of the greatest voices of tango: only Gardel was more important. If we don't know him so well today it is because he belongs to the late '20s and early '30s rather than to the Golden Decade of the 1940s. Charlo's tender and charming voice is just the perfect choice for the earlier material. This new CD presents Charlo singing mostly with Canaro's orchestra. There are also two tracks with Lomuto and two with his own orchestra. Naturally, none of this information is in the booklet! The CD is the successor to the long deleted El Bandoneón Charlo album to which it bears an extroardinary resemblance. Turning now to the fidelity: it's variable and at times disappointing. Nevertheless, the lover of the old material will not be able to resist. Con tu mirar is just exquisite. A nice CD of Ada Falcón, good selections, a little cleaning but not too much. A lovely CD of the charming Trío Argentino: Agustín Irusta, Roberto Fugazot, and Lucio Demare (piano), recorded in Europe in the 1930s. Finally, a CD of early recordings of Francisco Lomuto at a bargain price. Lomuto's early sides have a deep steady beat with a melancholic tinge and they are just fantastic for dancing. This album picks up Lomuto's discography in 1929 at a point when he had already cut nearly 400 sides! At this time, recordings had long since switched from acoustic to electrical. The fidelity is really good - someone has been hiding these 78s away somewhere. You can get a couple of Lomuto tracks with Charlo singing on the Charlo CD on this label. Tango Collection just get better and better, this time stunning us with some hard-to-find recordings of Firpo's orchestra. Like Lomuto, Firpo is one of those bands that you just wouldn't know had a huge recorded output from the quantity of material that's available nowadays. Firpo recorded over 2,800 tracks - that's three times D'Arienzo's output, and most of what has been released has been by his quartet rather than his wonderful orchestra. I wasn't expecting a Rodríguez album from Tango Collection . Would we perhaps get some of the unreleased tracks that we are still waiting for: No me lo digas, Tic tac, or the vals Que tilín… que tilon? No - it's the same stuff as on Reliquias but in poorer fidelity. Pff. Tango Collection are neither EMI Odeón nor BMG Ariola, so are uniquely placed to offer us this disc of Troilo instrumentals which includes his two stunning 1938 recordings on Odeón before he switched labels - tracks which EMI Odeón, to their shame, have never reprinted. Have they pulled it off? The answer, sadly, is no: most of the tracks, but especially the first two, are marred by excessive noise reduction. The average tanguero listening to this in their kitchen will be happy with this CD, and will buy it just to get those two rare 1938 tracks, for the rest of us this is a disappointment and a missed opportunity. Tita Merello was the woman with the big personality who was never afraid to camp it up. Actress as well as singer, she was even more successful in the 1950s than the 1940s and continued working into the 1990s. Witty and temperemental, she stamped her personality upon all her work. The milonga Se dice de mi, which she recorded with Canaro, is indelibly associated with her. You can see our terms and conditions here.